As a librarian, my goal is to challenge assumptions. I would like to surround the students of this school with reminders, via the vast and limitless world of learning, that they do not [regardless of what they may think] know it all. There are mysteries and unknowns abounding, and just waiting for the occasion to astound students with the thrill of new knowledge. So I will stock this library with the best of what the world has to offer, in the way of cool facts [Reference materials], worlds unknown [Fantasy], strangers to get to know [Biography], and situations to experience [Fiction] . . .
As those in my profession are still stereotyped as relatively inaccessible or quiet or shy, my goal is to be a presence that students are happy to come to. I want to cheerfully be open to questions, to welcome “interruptions,” and to not let busyness with work to be done prevent me from always keeping one eye watching for questioning kids and one ear cocked for a whispered wondering. Finally, how can I dare to promote a library if I do not devote myself to a lifetime of learning? I must pursue my own educational development. I cannot pretend to know it all already, and I cannot sit complacently in any semblance of “been there,” “done that,” or “know that.” I must get excited about new subjects to study and new skills to learn. And I will be transparent in my giddiness upon new discoveries. By doing so, I hope to impart to others the sense that it is a good thing, and a right thing, to be excited about learning. It was not your average wedding. Drizzles turned to torrents as the mother of the bride read, causing the Petit Prince’s wonderings to be nearly shouted not merely mused. Guests periodically turned to neighbors to relight hand held candles after gusts of wind had extinguished them. We performed mini leg lifts as we stood, in an attempt to revive numb toes. As the priest painstakingly broke the bread with his frozen fingers, raindrops dribbled down the back of my neck from one hole in the leaky tent. But we were actually all quite relieved at the recent improvement in our circumstances. One hour earlier, as I was putting the finishing touches on the bride’s makeup, the lights had flickered. 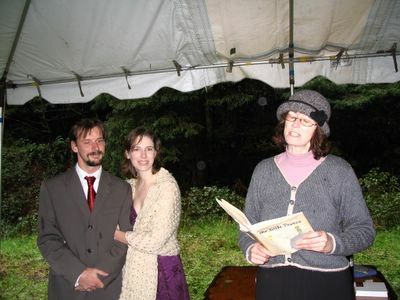 Moments later, astonished cries erupted when the house was suddenly abuzz with lights, whirs, and hums—“astonished” because, after four days without power, we had grown quite resigned to the certainty of a candle-lit, fire-warmed, stove-less-catered, and “charming”ly rustic wedding and reception. Indeed, we were such creatures of the dark that, suddenly illuminated by intense light, I flipped the switch off, preferring to resume the makeup process lit only by rain-darkened rays filtering in through the window. And frankly, as far as makeup was concerned, it really didn’t matter all that much; makeup and hair completed, Glenna [being who she is] had promptly re-donned her mud boots, shot out the door [with neither hood nor umbrella], and commenced with dragging benches across the marsh of a yard. Rain pouring down her face, she then grabbed the backhoe from the shed and began digging trenches to allow the deepening pond under to wedding tent to drain. Thankfully, by this point I was on one of my delivery runs to the tent, and I caught the bride in her soggy glory. I shook my head with a groan and quickened my trudge to a soldier-worthy march. I knew better, however, after three years as roommates, to put too much faith in my scolding pleas when head to head with Glenna’s dogged persistence. So I breathed a sigh of relief when she simply rattled off a string of preparation instructions and returned to the house for more bride-ish activities like, say . . . donning her wedding dress? Half an hour later our motley crew of a wedding party assembled for the processional—if one could call it that—through the rain. As we took a quick head count the bride’s brother rushed out to join us, apologizing for his inability to locate a pair of matching shoes. I easily reassured him, pointing out my own: having drenched my feet during preparations, I abandoned my shoes for the sake of borrowed wool socks and green & pink plaid rubber rain boots. Not once did I regret that decision. So out the door we went. Arm in arm, the two of us bridesmaids “dum dum da dum”ed a multi-pitched rendition of the Wedding March, while the groom adjusted his bride’s wayward dress strap for her. The goats looked up from their grazing as if noting our nuttiness, while the bride tugged her heel out of a sunken mound of mud. And all was oddly perfect. I could not, for the life of me, conceive of any place I’d rather be than in the mud on this day—January 3, 2006—in flood-ravaged Northern California. No, it was not your average wedding. But God in His heaven smiled down.